The map was developed using Sanborn Fire Insurance Maps from the late 1800s to 1908. The research was conducted to understand the history of the area and is used as a basis to identify and understand the evolution of the site in the past century. The map was developed using Sanborn Fire Insurance Maps from 1940 to 1955. The map was developed using Sanborn Fire Insurance Maps, DOQQ's, and GIS data from 1955 to 2004. The contextual map was included in order to show the location of the site in context with the Mississippi River, Lake Pontchartrain, French Quarter, and City Park. 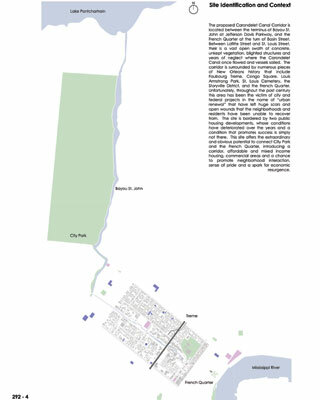 The map also offers a clear understanding of the opportunity to connect the French Quarter with Bayou St. John and City Park as it once was. 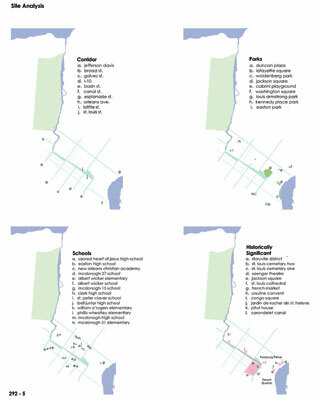 Important components of the site inventory were "exploded" to emphasize the possible integration of existing elements in the sites adjacent neighborhoods. These photographs were taken on numerous visits to the site and are organized to allow one to obtain an idea of the present condition of the site. 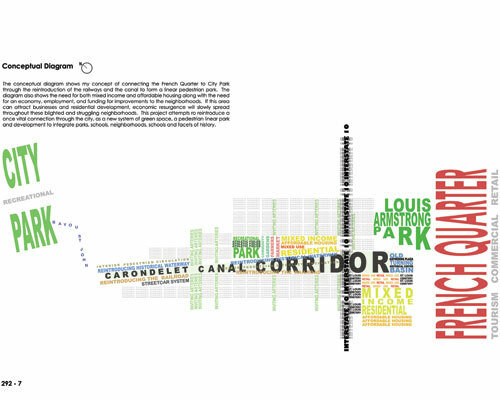 The conceptual diagram shows my concept of connecting the French Quarter to City Park with the reintroduction of the railways and the canal as part of a linear park. 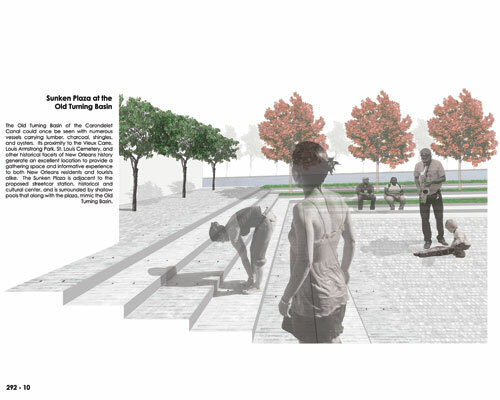 The project envisions, plans, and reintroduces a once vital connection within the city that consists of a new linear park system with coordinated development to integrate parks, schools, neighborhoods and whispers of the city's history. "Incredibly sophisticated. 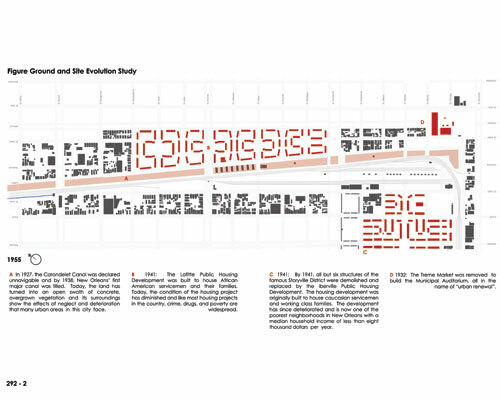 The graphic organization is highly evolved. The simplicity and clarity are refreshing." Time: This site offers a strong physical tie to the history of the region's cultural landscape through the clear remnants of the former Carondelet Canal and its proximity to many of the city's most historic areas. Place: The corridor bisects an array of nearby schools, parks, and neighborhoods, uniquely diversified by race, economic means and historical significance. Reintroduce the canal system and railway connection that would serve as the backbone for the site's development. Provide a connection of the French Quarter and City Park: Two of the cities most notable and unique areas. Integrate schools, neighborhoods, and other elements of the area along with whispers of history along the corridor. Provide affordable housing that suits the immediate and future needs of the community's residents. Establish a site specific example of how urban infill and redevelopment can promote positive growth and ignite an economic and social rebirth for which this area and city desperately yearns. In order to understand the goals and objectives of this project, one must first discover the past and grasp the effects of history on this once flourishing landscape. This project reintroduces a once vital connection through the city as a new corridor that will integrate the surrounding neighborhoods, parks, schools and facets of history. This area has struggled but is ready for rebirth. The human and social tragedy that followed Hurricane Katrina brought social and economic disparity to the forefront of American news, awareness, and conversation. The corridor will establish a backbone for development and a spark for economic resurgence. The Carondelet Canal, also referred to as the Old Basin Canal, was an operational New Orleans canal from 1794 to 1938. In 1794, under Spanish authority, New Orleans Governor Francisco Luis Hector, Baron de Carondelet, announced the plan to excavate a canal and construction of the waterway followed. The canal was to be 1.6 miles long and stretch from Bayou St. John to the back edge of New Orleans in the Treme neighborhood. A shallow, narrow version of the canal was completed by the end of 1794 and at that time, the canal was barely navigable, littered with roots and Cypress stumps. In the following two years, the canal was widened and deepened and made suitable for small vessels. In 1797, Governor Carondelet was transferred and by the time of the American takeover of the city in 1803, the canal fell into disrepair and deteriorated quickly. After the Louisiana Purchase, James Pitot worked extensively to promote improvements to the canal. Beginning in 1805, the Orleans Navigation Company revitalized the canal and bayou. By the mid-1800s, 70 to 80 vessels could be found navigating the canal on any given day. At the terminus of the canal, an 80,000 square foot turning basin was used as a landing depot for vessels carrying oysters, lumber, charcoal and other building materials. Warehouses began to line the canal and its importance matured. In the 1830s, a competing New Basin Canal was constructed. By the time of the Civil War, the New Basin Canal was doing more than twice the business of the Carondelet Canal. The canal slowly lost its luster but was still economically important in the early 1900s due to the oyster business. After the first World War, use of the canal declined even more and in 1927, New Orleans' first major canal was declared unnavigable. It was filled by 1938, but remnants of the canal remained apparent, forming an open swath of concrete and overgrown vegetation through otherwise densely populated neighborhoods, still making an imprint upon the geography of the modern city. At one time, Treme was prosperous and diverse, both ethnically and culturally. The community is one of our country's oldest African American neighborhoods and is significant to history as one of the initial communities to openly house "free people of color." In the days of segregation, Treme residents were forced to initiate a self-sustaining system of infrastructure, creating businesses, schools, churches, and forms of social aid. Social Aid and Jazz Clubs had their members donate to a combined fund so that when economic struggles existed, residents would have immediate access to economic means for survival. It can be said that the culture of the Creole people and the "free persons of color" is rooted deeply in Treme. In 1730, Fort St. Ferdinand and Fort St. John were established in what is now Treme. Chevalier Charles de Morand constructed the city's first brickyard and plantation. By 1780, Claude Treme had acquired most of the Morand estate. The land was given great value in 1794 when the Spanish Governor of Louisiana, Baron de Carondelet, announced plans to create a canal that would connect Bayou St. John to the city. By 1883, Treme had expanded quickly and there were very few undeveloped lots in the area. Residents settled into many double shotgun houses and Creole cottages. The community prospered and produced many of New Orleans' most historically significant landmarks. The Treme Market and Rocheblave Market were two of several public farmers markets that were the backbone of the city's economy. They functioned in the Treme neighborhood from 1841 to 1932. The Treme Market was located on the neutral ground of Orleans Avenue between Marais and North Robertson Streets and extended over Villere Street. The market was built in the 1830s and existed until 1932 when it was demolished to build the Municipal Auditorium. In 1941, the Lafitte Public Housing Development was built to house African American servicemen and their families. Today, the condition of the housing development has diminished and like many housing developments in the country, it has been infiltrated with crime, drugs, and poverty. In that same year, all but six structures of the famous Storyville District were demolished and replaced by the Iberville Public Housing Development. This development was originally built to house Caucasian servicemen and working class families. The development has since deteriorated and is now one of the poorest neighborhoods in New Orleans with a median household income of less than eight thousand dollars per year. In the 1960s, the Louis Armstrong Park and Theatre of Performing Arts were built. Many see this as an inviting and beautifully landscaped space. The Treme residents however see a deep wound and the open scar it left behind. Forty years ago, thirteen square blocks of houses, stores and jazz and social clubs were destroyed to make way for the park, theatre, and cultural center. 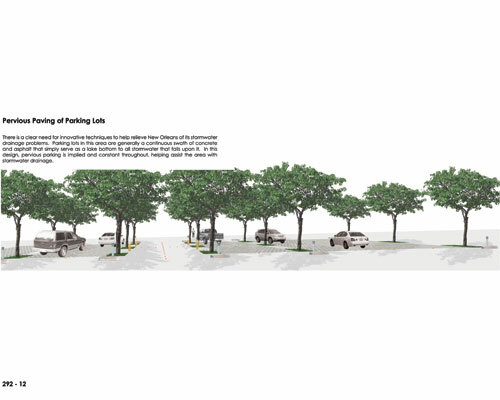 The neutral ground of Claiborne Avenue was previously beautiful and park-like. It was ten blocks long, 100 feet wide and covered about fourteen acres. The neutral ground was lined with four rows of mature Live Oaks that totaled about 250 trees. People would gather, talk, and "embrace each other in the daily rituals of life." Claiborne Avenue was lined with businesses and residences and was the center of culture and economy for African American New Orleanians. It was arguably the most prosperous African American business district in the country. In 1966, the Live Oaks in the neutral ground were cut down, businesses and residences were demolished, and the prosperous business district was ignored to make way for Interstate 10. Massive concrete pillars replaced the mature Live Oaks; the sounds of cars replaced daily conversations. This construction had perhaps the greatest negative influence in a series of events suffered by this area in the past century, bisecting Treme and further diminishing the desirability of the neighborhood, resulting in more abandoned properties. Treme has never recovered. 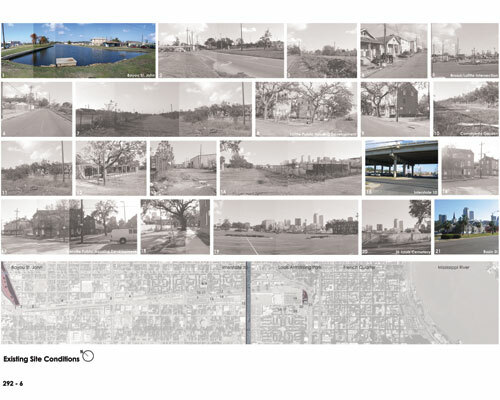 The site of the project is the abandoned and filled skeleton of the former Carondelet Canal (Old Basin Canal) that stretches 1.6 miles from Bayou St. John to the French Quarter. It is a site deeply rooted in the history of the New Orleans landscape that is now only a swath of concrete, overgrown vegetation, and abandoned properties. This swath presents a unique opportunity to link the French Quarter with City Park, provide a backbone for economic resurgence, and establish a corridor that would integrate schools, neighborhoods, and whispers of history told along the corridor. The principal challenge of this project is that all responsibilities, including site selection, inventory, analysis, and design were previously undefined and solely an individual assessment. This site was uniquely challenging in that the deep history and residents' social and economic struggles and needs must be embraced while attempting to provide a post-Katrina New Orleans with a site specific example of how urban infill can promote positive growth and rebirth to a city whose future is unknown. 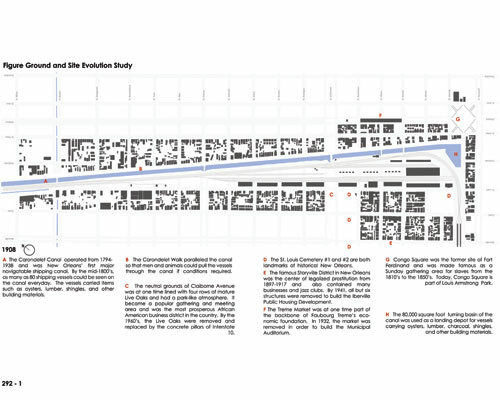 The needs of this project resulted in a strong fusion of historical research, site inventory and analysis, and social and economic census studies. 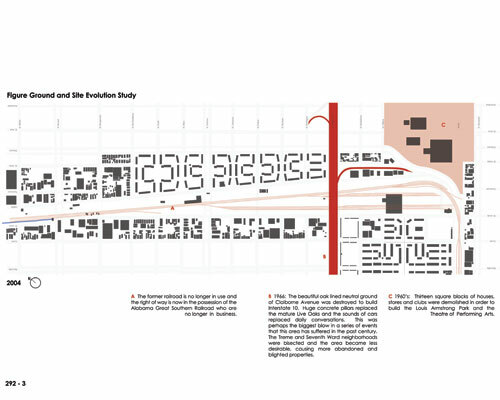 The data and analysis collected was both on a city-scale and a corridor scale. I researched the historical significance of the specific site and all its surrounding neighborhoods extensively, building a strong foundation of knowledge that helped to shape and define spaces and incorporated elements of the past landscape into the site plan. Site inventory including schools, churches, parks, and historic districts were defined using existing GIS data provided by the New Orleans City Planning Commission. Demographic, social, and economic data was analyzed and provided by the 2000 U.S. Census. Although the data has been drastically altered in the aftermath of Hurricane Katrina, the pre-disaster data offered a basis for the aspects of inequality, neglect, and struggles that these impoverished New Orleanians faced in the recent past and continue to experience. Reports and data produced by organizations such as the Bring New Orleans Back Commission, Louisiana Speaks, and FEMA were examined and considered throughout the course of this project. I also depended on the knowledge of many individuals including interviewed residents of the Treme' neighborhood and the City of New Orleans. I spent many hours walking and driving the site, speaking with residents, taking detailed inventory, and photographing the site. The Carondelet Canal Corridor project would be constructed in a series of phases determined by the needs of the neighborhoods residents, and the city. A commitment to funding all phases would be necessary to ensure that the project is not abandoned or the vision is only partly accomplished. The involved parties would include the City Planning Commission and post-Katrina created organizations. Residents would need to be involved in the planning from the beginning stages to ensure that needs and desires are met. Funding from the city, state and federal governments would also be essential for the substantial project to be realized. Priority would be given in Phase One to the immediate need for housing that would initially include the selection of minimally damaged structures, renovation of structures, and the resulting resurrection of a safe and sustainable environment in the existing public housing developments. Phase Two would involve the construction of the physical corridor that would include the reintroduction of the waterway and railways for New Orleans street car and pedestrian circulation. The linear park would begin to connect the French Quarter with City Park while beginning to provide a backbone to all future development of the site. Ideally, Phases One and Two would overlap, helping to resolve the city's immediate needs and distinguishing a foundation for the future development of the comprehensive project. Phase Three would begin to implement the urban infill needed to spark the economic growth that the area and city desires. Development would include pockets of mixed-use retail and commercial space along with mixed-income and affordable housing units. The identified structures incorporated in Phase One would be selectively re-established and divided into affordable housing units for residents with the required avoidance of gentrification. An essential quality of the project's success is realizing that full completion is several years away. Implementation in a phasing program would provide the corridor with individual, self-sustainable "communities" within the project as a whole. This approach provides the opportunity to establish significant social and economic change in a timeframe that is as immediate as possible and strengthens as the project progresses. Drainage and shipping canals have been part of New Orleans' urban fabric for centuries. In 1794, excavation began for a drainage canal that by 1817 would be the city's key commercial waterway: Carondelet Canal. At the turn of the twentieth century, the Carondelet Canal still served as a local industrial corridor through the enchanting cityscape which comprised the French Quarter, Treme Market, Storyville District, St. Louis Cemeteries, Congo Square and the expanding Creole Faubourgs such as Treme that were directly associated with the development and evolution of jazz. By 1938, after years of decay and under use, the canal was filled. Remnants of the canal remained apparent, forming an open swath of concrete, unkempt vegetation, and blighted properties through otherwise densely populated neighborhoods. The canal helped connect the old city of New Orleans to the new developing city and provided a link to the rest of the world for well over a century, and still makes an imprint upon the geography of the modern city. 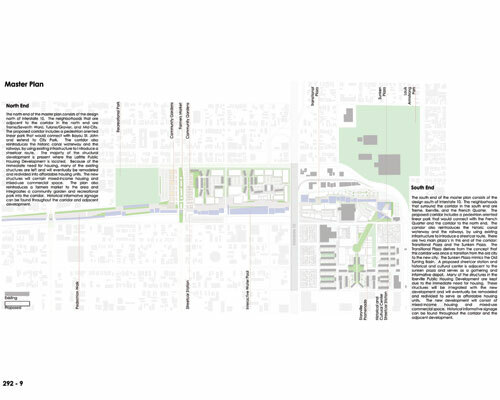 This project reintroduces a once vital connection through the city-the waterway and railway-connecting City Park and the French Quarter with a new system of green space and boulevards, integrating neighborhoods, parks, schools, and the rich history of the city. This approach to urban infill and redevelopment combines a need and desire for economic resurgence and the recognition that the canal system is deeply rooted in New Orleans history. The corridor extends 1.6 miles from the French Quarter northwestward to Bayou St. John, offering a strong physical tie to the city's cultural landscape history, where vacant land and boarded up structures will be adapted to new and multiple uses to serve the contemporary needs of a yearning city on the edge of rebirth. 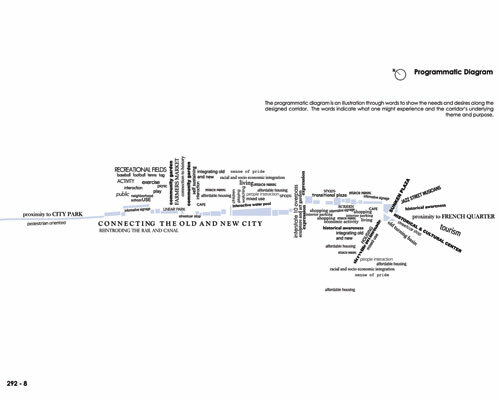 The programmatic diagram illustrates with words the needs, desires and activities along the proposed corridor. The words indicate what one might experience as a result of the proposed corridor's underlying theme and purpose. The master plan is a fusion of two ends divided by Interstate 10: North and South. Each end has unique, distinctive components that are unified through the linear park, canal and railway. The Sunken Plaza would be adjacent to a proposed streetcar station and historical and cultural center. It would be surrounded by shallow pools that along with the plaza, would mimic the Old Turning Basin of the former Carondelet Canal. 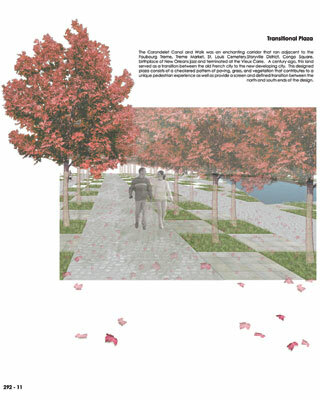 The proposed plaza contributes to a unique pedestrian experience and provides a defined transition between the north and south ends of the corridor. A century ago, this land served as the transition from the old French city to the new developing city. There is a clear need for innovative techniques to help relieve New Orleans of its stormwater drainage problems. Parking lots in this area are generally a continuous swath of concrete and asphalt that multiply the problem tremendously. In the proposed corridor, pervious paving in parking areas is implied and constant throughout, assisting the area with stormwater drainage. The Community Gardens becomes fertile ground for neighborhood interaction and pride. 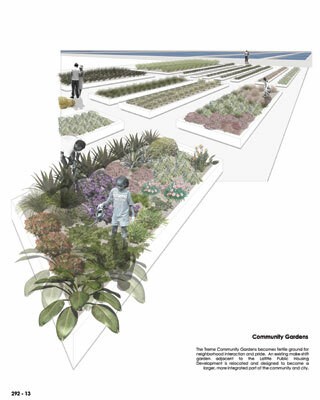 An existing make-shift garden adjacent to the Public Housing Development is relocated and designed to become a larger, more integrated part of the community, city, and proposed Carondelet Canal Corridor. The Treme Market and Rocheblave Market were two of several public farmers markets functioning in the Treme neighborhood from 1841 to 1932 and were at that time the backbone of the city's economy. 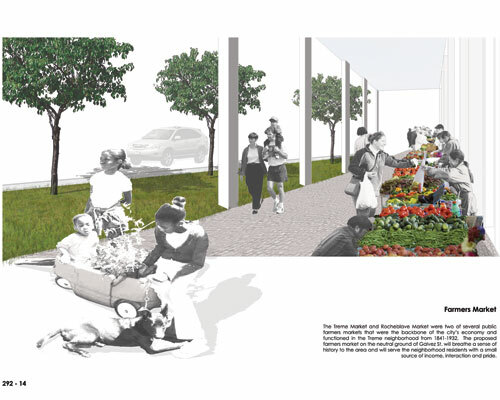 The proposed farmers market will breathe a sense of history to the area and will serve the neighborhood residents with a small source of	income, interaction, and pride.